Cosmopolitan cafes lining beautiful white sand beaches, the giant golden dome of a local shrine rising over homes clad in Jerusalem stone, an oasis in the middle of a vast desert of sand... these 8 days in Israel bring us into the middle of a region of fascinating contradictions. At any given time you may find yourself reading a newspaper while you float weightlessly in the Dead Sea, sprawled out under the sun at the gay beach full of locals, exploring one of countless world-class museums, or taking in the unique culture and traditions on display through the streets of this Middle Eastern region. 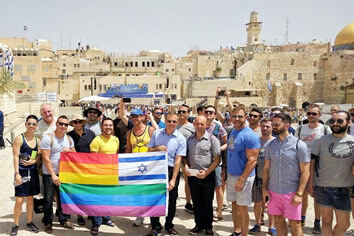 Our 8-days Israel gay group trips include many of the "big ticket" items of your experience, ground transportation, breakfasts and guided visits to Jerusalem, Masada & Tel Aviv. ** - Trip prices based on twin share. Traveling solo? We'll match you up with another traveler at no extra charge, or just pay a $790 single supplement for your own room! 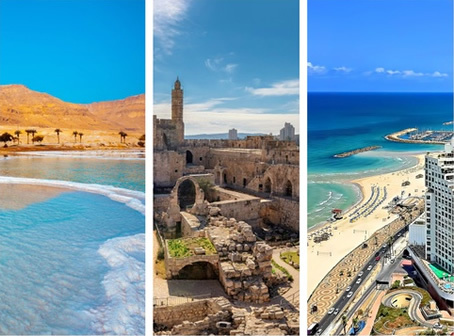 Our 8-day gay group trip through Israel takes us into some amazing destinations including the famous Dead Sea, the vibrant Tel Aviv, and the melting pot of Jerusalem. Check out the brief itinerary below. The largest city, capital city, and central hub of culture and history in Israel, and one of the world's oldest and holiest cities. We'll have a fantastic local guide join us through the city to ensure we really make the most of our time at its historically significant sites and learn about its tumultuous history. Our group hotel in Jerusalem is where we all come together to start our adventure at 4:00pm on day 1! If you're flying into Israel on this day just try to arrive in time to get to our group hotel... or if you'd prefer to arrive a day (or more!) early and you'd like some assistance with setting up any extra nights in our group hotel just let us know, we'd be happy to help. Keep in mind that Tel Aviv and Jerusalem are only 45 minutes apart by road so if you'd like to spend extra nights in Tel Aviv before meeting the group in Jerusalem on day 1 we can assist with that too! One of the world's great historically significant cities, Jerusalem remains an incredibly important place of pilgrimage and worship for many of the world's largest religions. Few places in the world sit in the center of so many conflicting beliefs and cultures, and that's exactly what makes this city such a fascinating place to experience. Even for non-believers the streets of Jerusalem are lined with engaging history at every turn, and just walking them provides a glimpse into the lives of millions who put so much importance on these very streets. Our group trip starts here in Jerusalem, the perfect place to build a foundation of our Middle Eastern experience that we'll be experiencing together for the next 8 days. We'll have some time walking and learning with a local gay guide, then plenty of time to choose from many different unique activities such a visit to the world famous Holocaust Museum (Yad Vashem), the Dome of the Rock, the Western Wall, or explore the markets of the Old City. For the more adventurous ask about current advice for visiting Bethlehem, or Jericho, the world’s oldest city, both located in the Palestinian West Bank. Imagine being at the lowest point on Earth, surrounded by the beauty of the Negev Desert, and you're on your back floating weightlessly in the mineral-rich waters of the famous Dead Sea. It's incredibly relaxing and one of those memorable bucket-list items that we're excited to check off with you! Spa treatments using the natural Dead Sea minerals are very popular here, as is taking a bunch of photos covered in Dead Sea mud or floating effortlessly in the sea. Don't worry about sea monsters here either - no sea life lives in these salty waters! Before we reach the Dead Sea, on our short trip from Jerusalem, we'll be stopping at the UNESCO World Heritage Site of Masada. Perched high atop the rocky cliffs overlooking the Dead Sea with the mountains of Jordan to the east and the desert stretching to the south sits the ruins of an ancient fortress and home to the remains of King Herod's Palace, built in 30 B.C. There's plenty of stories to be told of this last stronghold against a Roman invasion, most dramatically its demise as 960 inhabitants committed a mass suicide as it fell to the Romans. Today it's an incredibly impressive site with visible remains of palaces, a Roman-style bathhouse and plenty of mosaic floors. 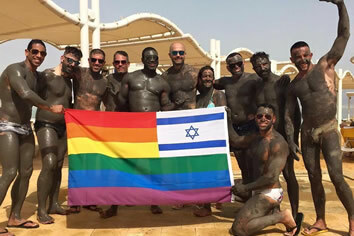 Although it's not the largest city in Israel (Jerusalem is #1) Tel Aviv is known around the world in the gay community as a super hot destination for gorgeous beaches, vibrant nightlife, and impossibly handsome locals. It's a city that has completely embraced the gay community with one of the world's favorite pride festivals in June, a year-round gay beach on the beautiful bank of the Mediterranean Sea, and a lively social scene. This is why we ensure that our trips spend the weekend here in Tel Aviv, to maximize our ability to enjoy the gay hotspots whether that's the cafes, the beach, or the bars. While it's definitely got lots to keep us entertained, it's not just known for its hedonism, it also has plenty of museums, street markets and history here too. We'll spend a few hours with a local gay guide who will take us on a walk through the Jaffa district and along Rothschild Boulevard telling stories and pointing out important sites along the way. The beachfront promenade is one of our many favorite places for getting some sunshine but if you're looking for something a bit further afield you may want to take a day trip up to the iconic immaculately landscaped terraces of the Bahá'í Gardens at the spiritual and administrative center of the Bahá'í faith. We'll soak up the sun and fun here in Tel Aviv before saying goodbye to all of our crew we've just explored Israel with on the 8th day. Our 11-day travelers will continue on to the final days of their trip in Jordan mid-day on the 8th day, but you're welcome to book your departing flight out of Israel at any time on this day. Our advice is simple. Pack your bag, then take half of those things out and leave them back home. It’s common to hear people wishing they’d packed less stuff, but we’ve never heard anyone complain that they didn’t bring enough. Even if you realize you forget to pack some crucial item you can always pick up a replacement once you arrive in Israel. More packing information including a suggested packing list is included in your "Pre-trip Guidebook". We do absolutely everything possible to avoid needing such a mundane awakening. A world without alarm clocks is one we want to be part of, and your “rise and shine” while in Israel should come from the sound of a call to prayer or camels spitting in the distance. We don't anticipate any early mornings on this trip as all travel days are quite flexible. Our Detours groups are run with a minimum of 4 travelers and up to a maximum of 15 travelers. Ages of group members vary but around 90% of our travelers are in their 30's, 40's, and 50's. Whatever the age of the guys on our trips everyone's already got something in common, an exciting new experience in a new country! Each group is led by a Detours trip leader who is there to ensure everything goes off without a hitch, allowing you to focus on having the time of your life! We welcome both men and women onto our trips although it’s important to know that most groups are 100% gay men. Relax – we won’t keep you from updating your Facebook status the whole trip. There is WiFi all over the place and available at every hotel we stay at. If you’re more the “E.T.” type and would just rather call home, feel free to pick up a calling card at a corner store and make use of the many local payphones. Alternatively, if your mobile phone is "unlocked" you can pick up a local SIM card which is quite affordable. Further information can be found in your "Trip Preparations" guidebook which will be available to you after your trip signup. 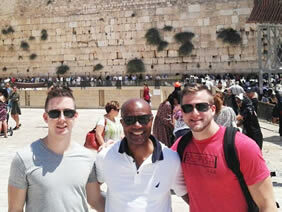 However, if you have any further questions about your Israel experience please visit our FAQ page or contact us.